Doing things by halves - successfully! After abandoning its old single designed by Walter Moore, NSU unveiled a supercharged 350 twin with two overhead camshafts in 1938. The outbreak of war and the ban on forced induction put an end to this project, but t.he Neckarsulm company was on a roll. The same engine served as a basis in 1951 for the record-breaking 350 and 500cc machines, which recorded speeds of 189 and 211 mph ridden by Wilhelm Herz. Some of the record-breakers' features like the twin shaft drive for the two overhead camshafts were used on the Rennmax, which dominated the circuits in the 1950s, but its evolution was a gradual process. NSU designed a 500cc four developing 53 hp at 9000 rpm, but it proved too fragile and was abandoned; from that project, a 125cc single and 250 twin were evolved. Faster than many 350s of its day, the 250 Rennmax was the sole twin-cylinder machine to challenge the four-stroke singles. It made its racing debut in 1952, ridden by Werner Haas. 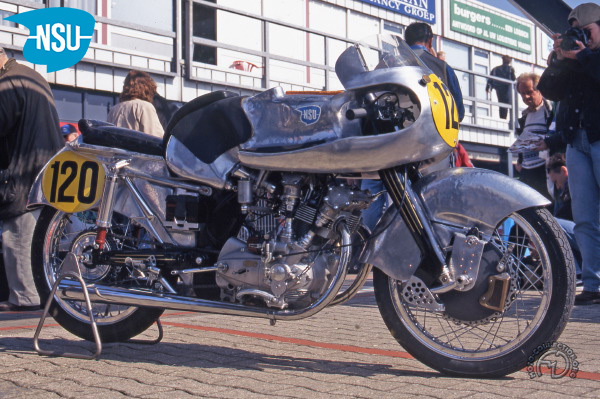 Six months later, the Rennmax had progressed from 25 hp at 9000 rpm to 29 hp at 9800 rpm and finished second behind the four-valve Guzzi ridden by Lorenzetti. It was the start of two years of absolute supremacy. Improved further, the 1953 Rennmax adopted a new pressed-steel frame from which the engine was suspended. That year, Haas was the first German world champion and only the second rider to achieve a winning double by also taking the 125 title. The 1953 Rennmax had a superb hand-beaten aluminum fairing; also shown (inset) is the engine of the tubular-framed 1952 Rennmax 250.